Named for the Jubilee (50th. anniversary) of transcontinental passenger service this wheel arrangement was quite rare the CPR being the only railway in Canada to have it. 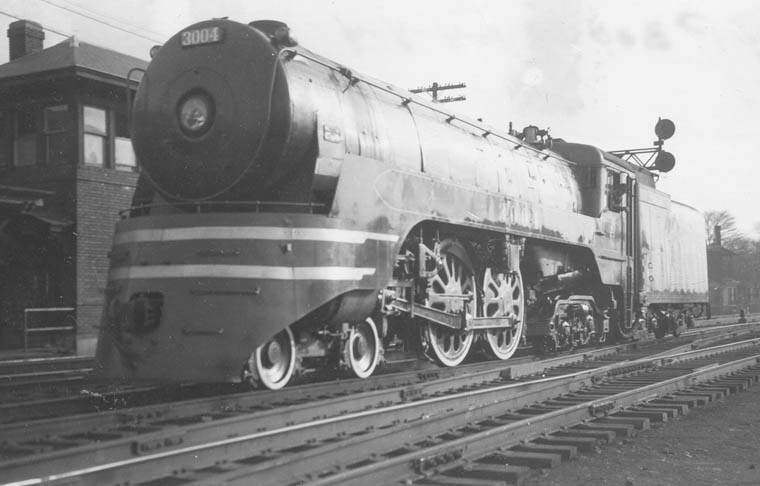 In the US only two were built, the 4-4-2 Atlantic being preferred for light, fast passenger trains. 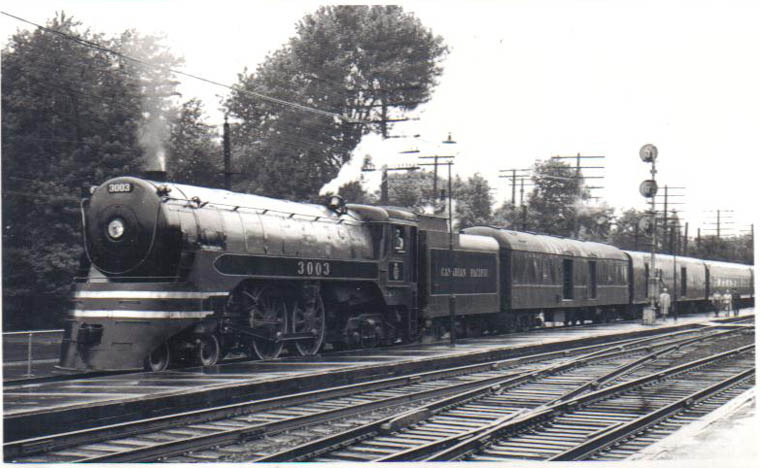 The CPR used them on light, fast passenger trains, branchline passenger and freight trains across the system. 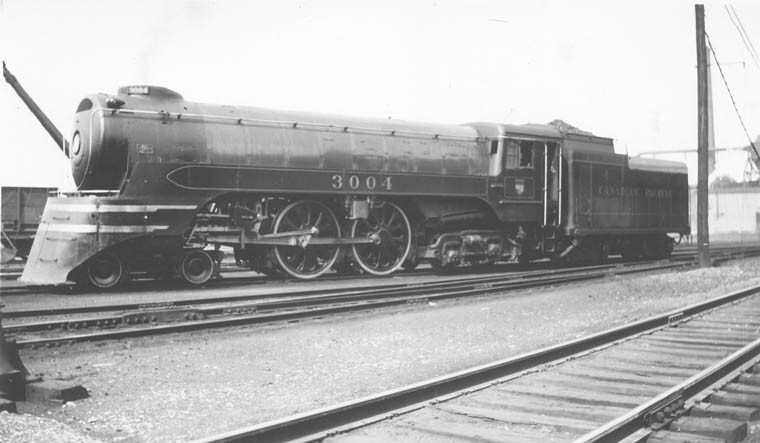 The earlier Jubilees were the famed F2 class 3000's that hauled lightweight passenger equipment newly designed and built to modernize service. 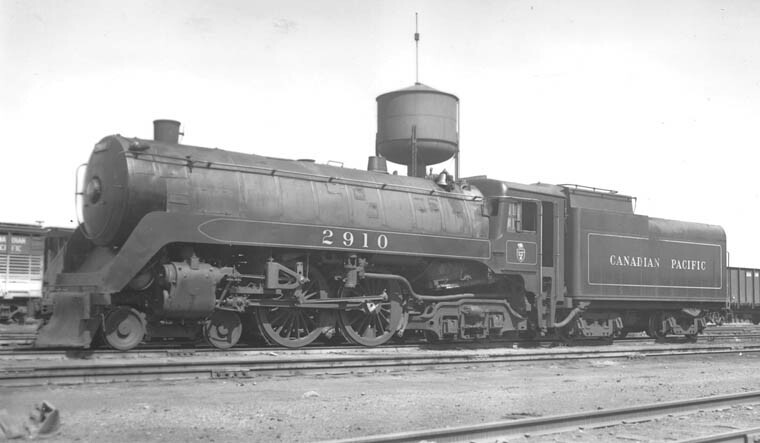 There were only five of these stoker-equipped engines with 80 inch diameter drivers and 300 pounds per square inch boiler pressure. Top speed: 112 1/2 mph! 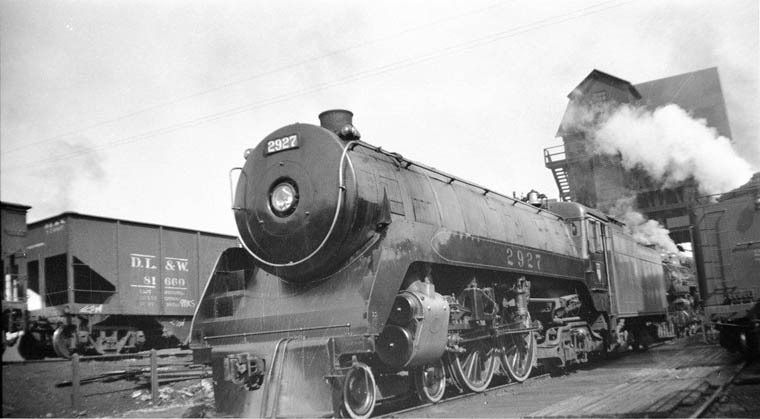 Two were assigned to Montreal-Quebec City service, two more to Toronto-Windsor and a single one (3001), oil-fired, to Calgary-Edmonton. 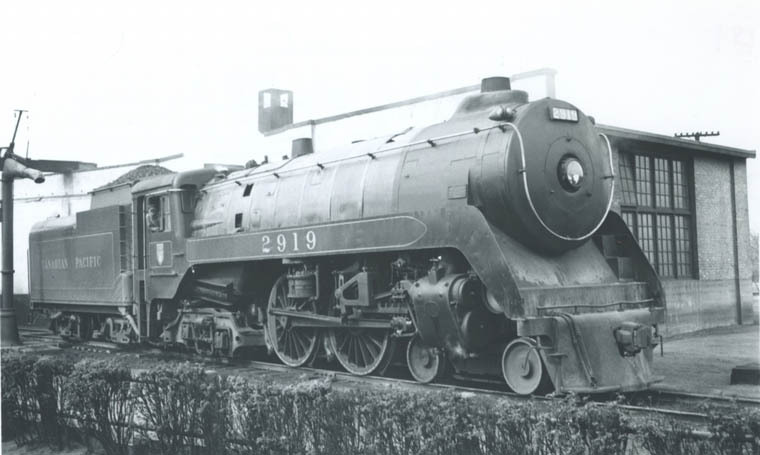 These were true high-speed mainline engines while the 20 newer F2 class 2910-2929 were mostly hand-fired coal burners (except 2915 and 2918 oil-fired) with 75' drivers meant for light dual service. 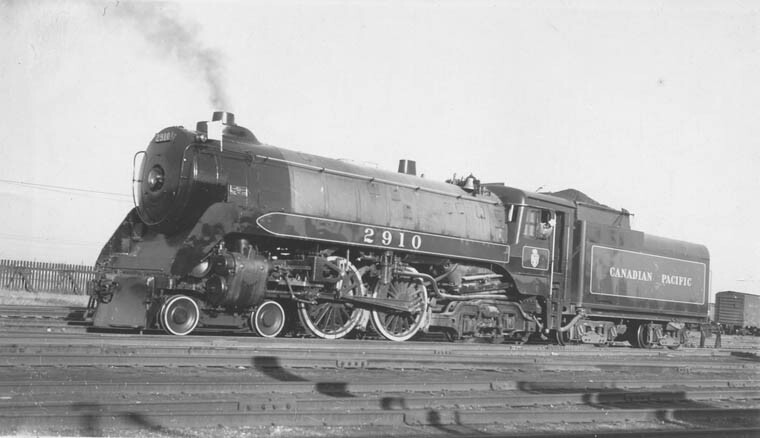 Note: These engines would have been numbered 2900-2919 except for the two I1a class 4-8-2's 2900 and 2901. 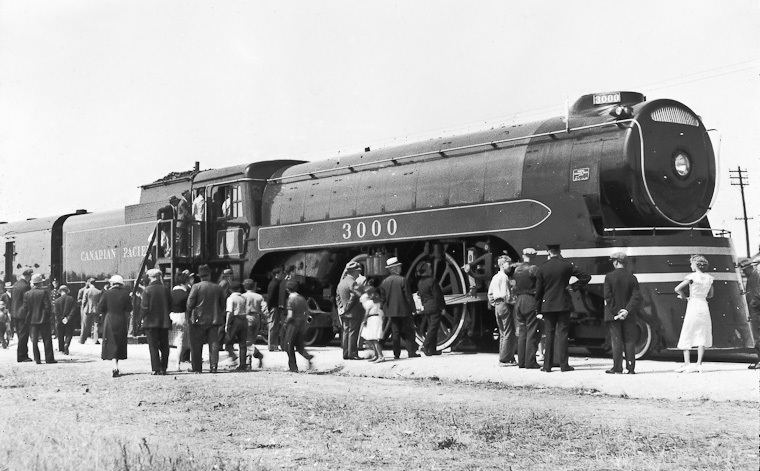 Lots of people are admiring this modern streamlined passenger locomotive on display for them. Caption and date unknown. Positive slide. 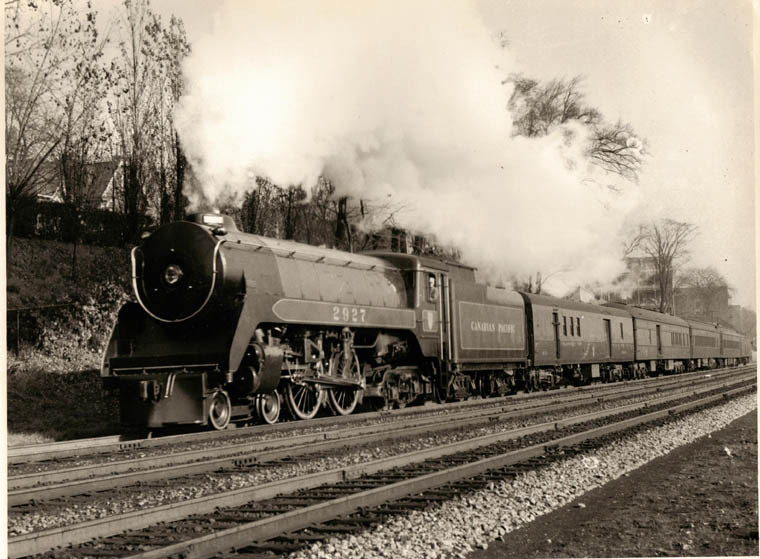 Old Time Trains Archives. 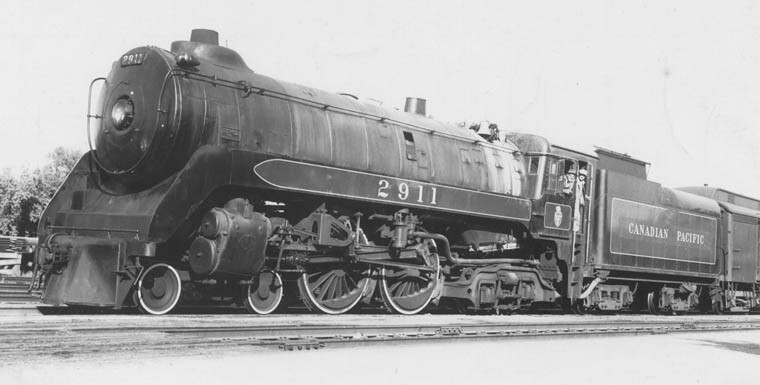 F2 3001 Chinook the only named Jubilee (or any other modern CPR steam engine). Named for the train it hauled between Calgary and Edmonton. 1942 L.A.Stuckey/Ken MacDonald Joseph Testagrose Collection. 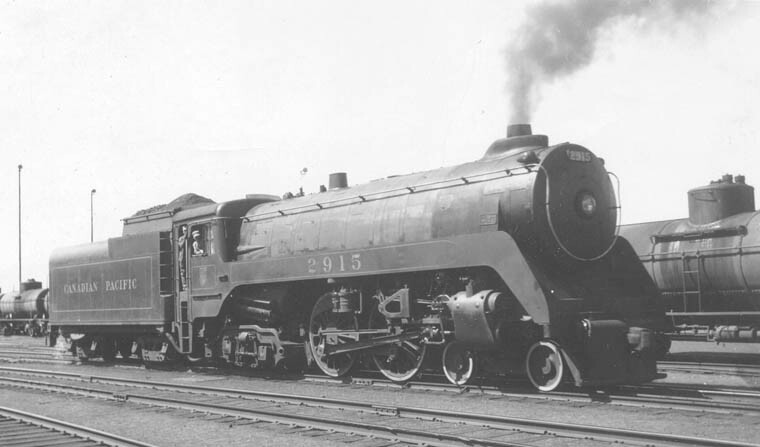 Note the different pilot (same as a 2900) also lack of streamlined shrouding due to the large number of level crossing collisions. 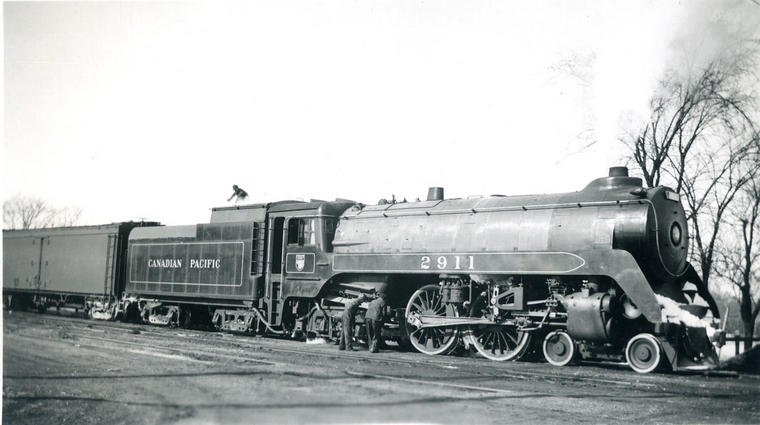 3003 taking water on the shop track at the Glen. 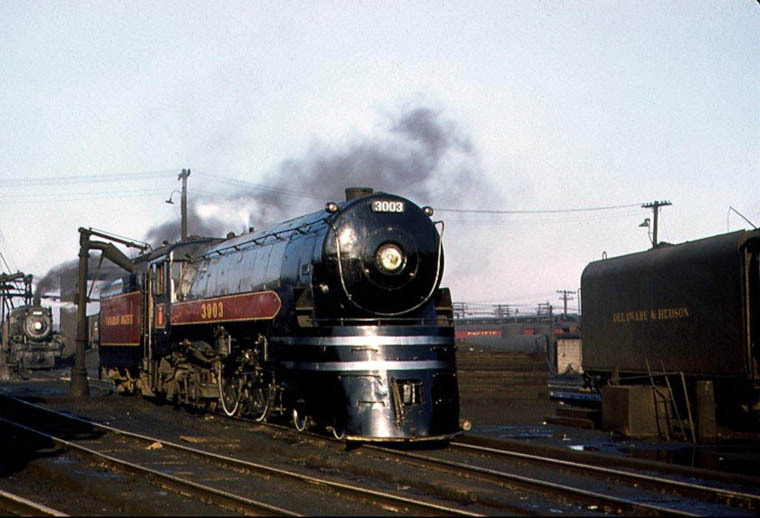 Note Delaware & Hudson tender at far right. 3003 running light to Windsor station. 3003 with evening train at Montreal West bound for Quebec City. 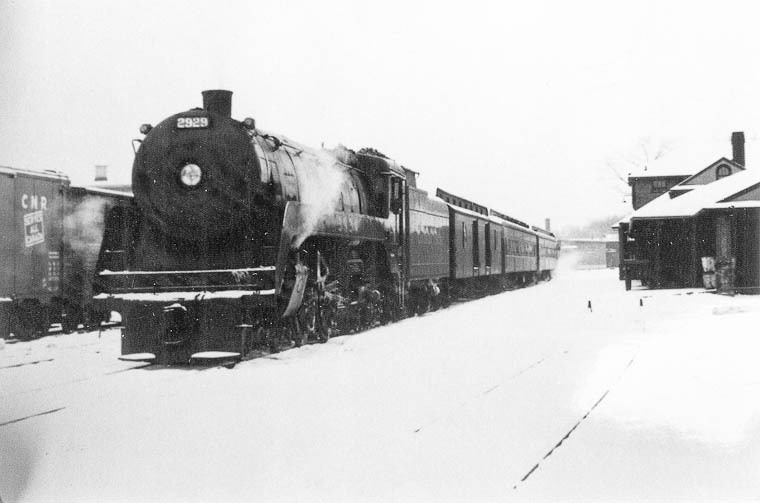 F2 class 4-4-4 with matching consist of lightweight passenger equipment leaving Place Viger station in Montreal. 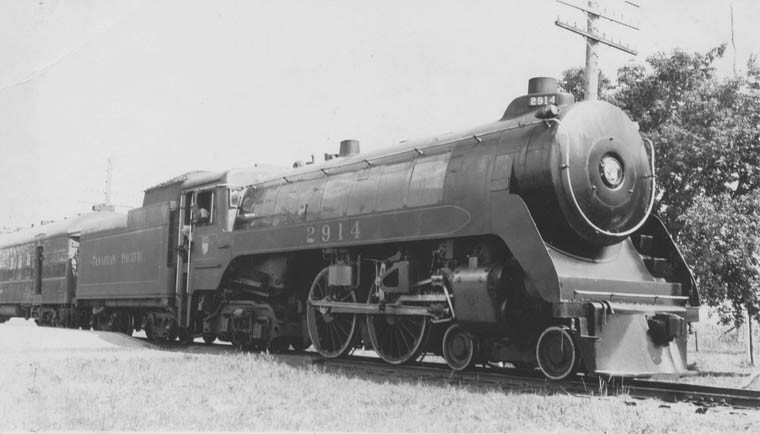 F2a 3002 Cyl. 17 1/4" x 28" Drv. 80" Press. 300 lbs. 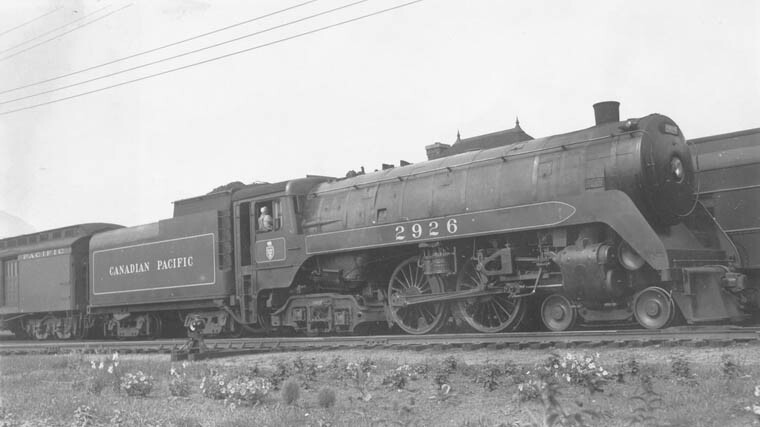 26,600 t.e. 12 tons 7000 gals. 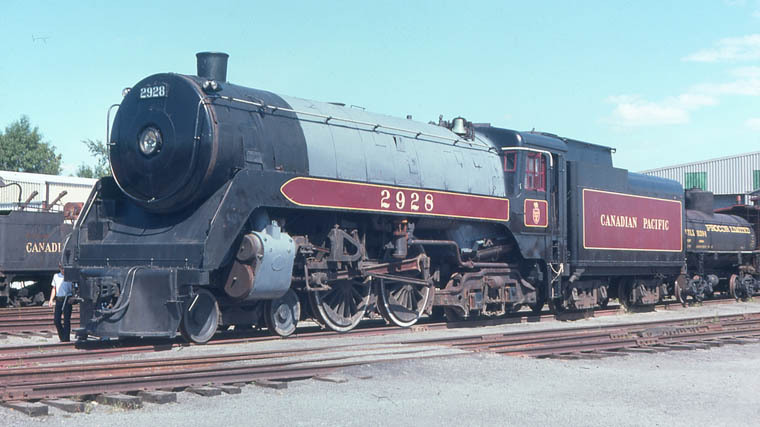 2910-2929 Cyl. 16 1/2" x 28" Drv. 75" Press. 300 lbs. 25,900 t.e. (26%) 12 tons, 7700 gals. 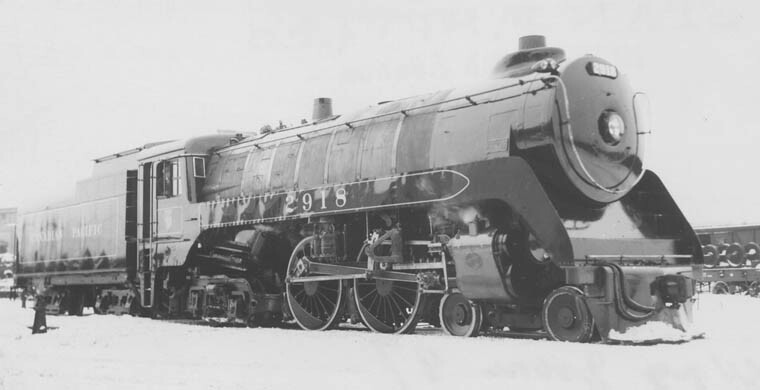 Canadian Locomotive Co.
F1a without its shrouding shows how small a diameter of boiler these engines have and what is hidden beneath. Note the stack extension and cowling with built-in illuminated number boards also, the teardrop style classification lights. 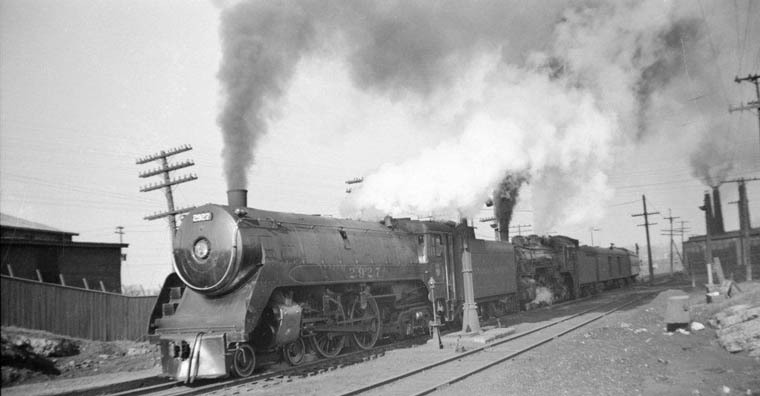 The stack extension was a Western Lines feature to improve smoke deflection which was especially bad at speed with light tonnage. 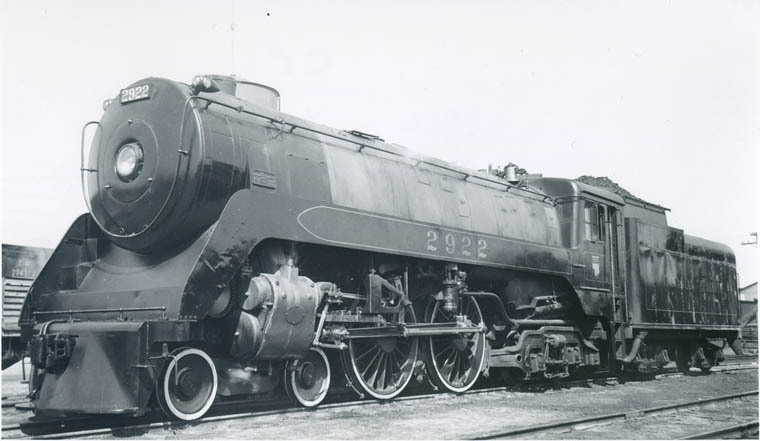 The cowling was later removed as it was on the newer 2800's; so too were the teardrops done away with on all early semi-streamlined engines. 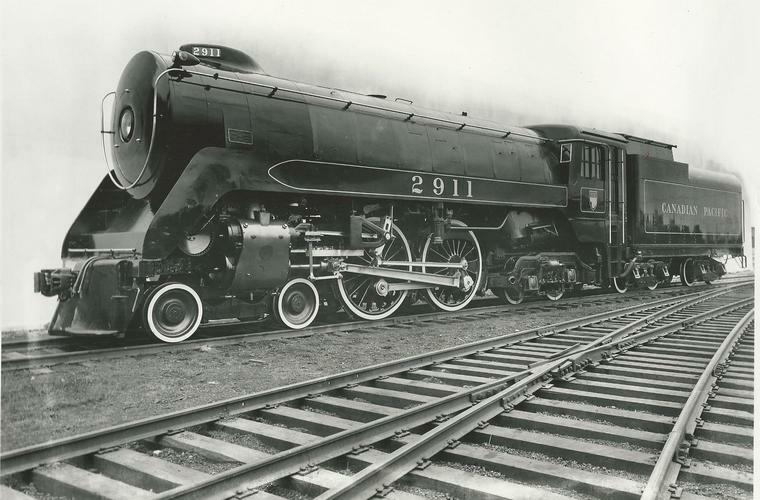 Only a single order for 20 engines (2910-2929) were built by Canadian Locomotive Company. Modern in every aspect save for one; they were hand-fired! 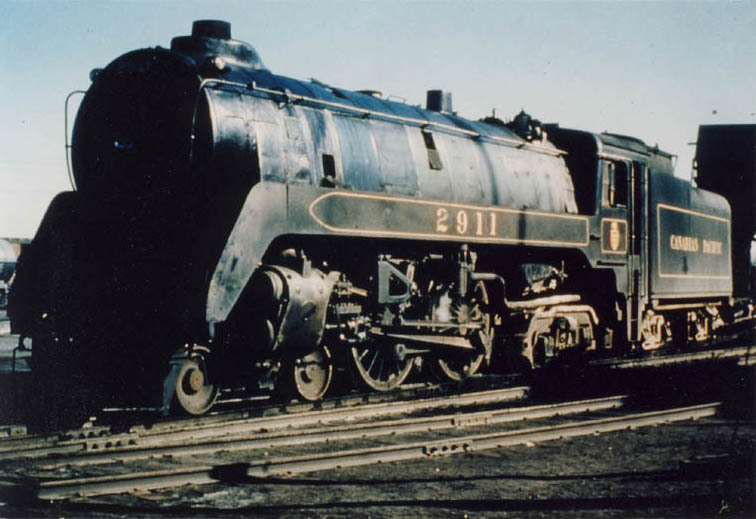 Two were preserved, 2928 at Delson (CRM Exporail) and 2929 at Steamtown. 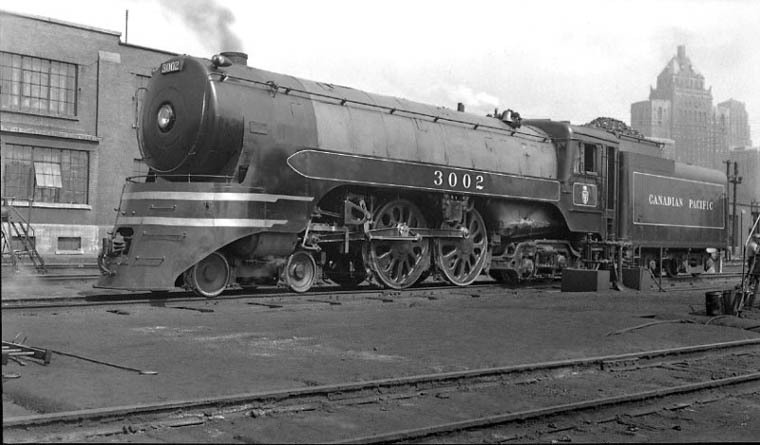 Sadly, none of the 3000's were saved due to a misunderstanding whereby Angus and Ogden each thought the other was saving one! Ogden was supposed to save the oil-burning 3001 used on the Chinook. No. 137 engine 2914 at Kemnay, Manitoba just west of Brandon where the Estevan Subdivision leaves the double track Broadview Subdivision. Train sits at the platform behind the station at the end of the west to south curve. 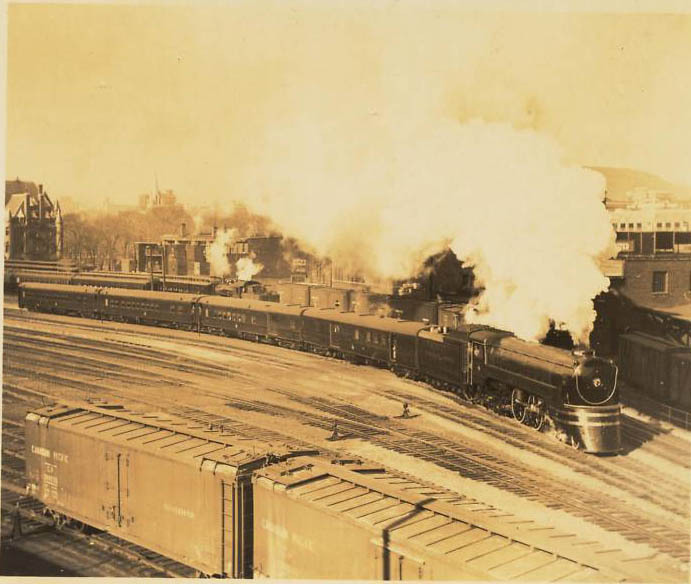 Only passenger trains on the branch were Nos. 137 and 138 operating between Brandon and Estevan daily except Sunday. 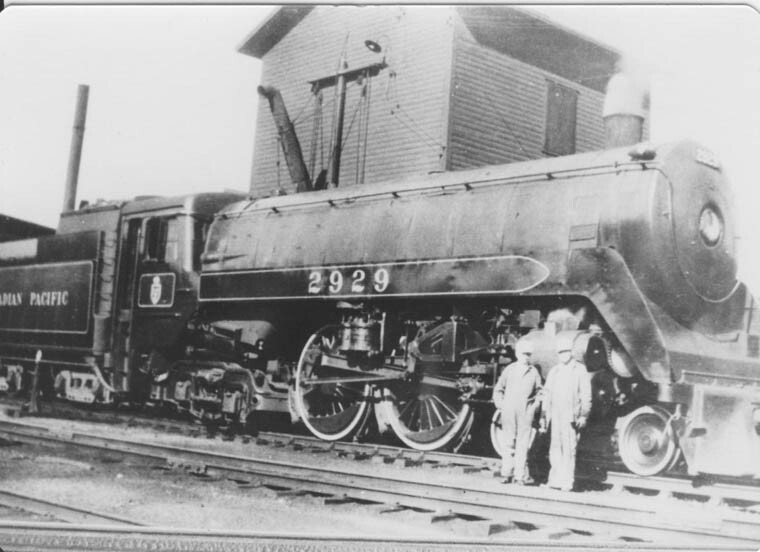 2918 at Winnipeg. Dated JUNE 1947! I know they get lots of snow but this is clearly the wrong date. January? 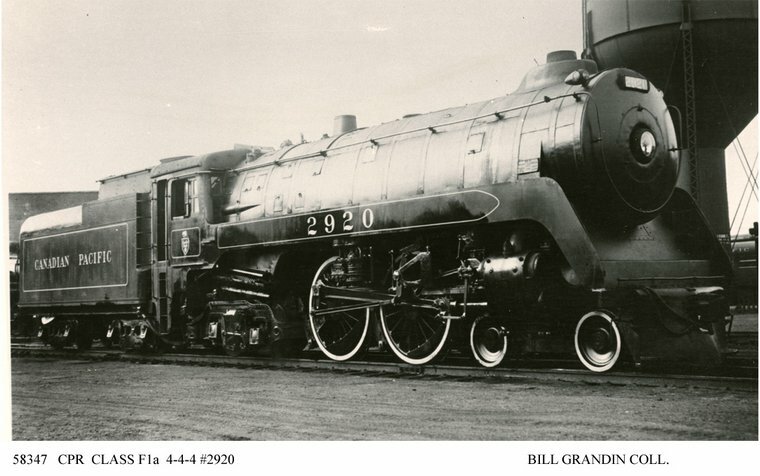 With bell clanging, 2920 sits at the siding switch just west of the station, Outlook, Sask. after coaling. 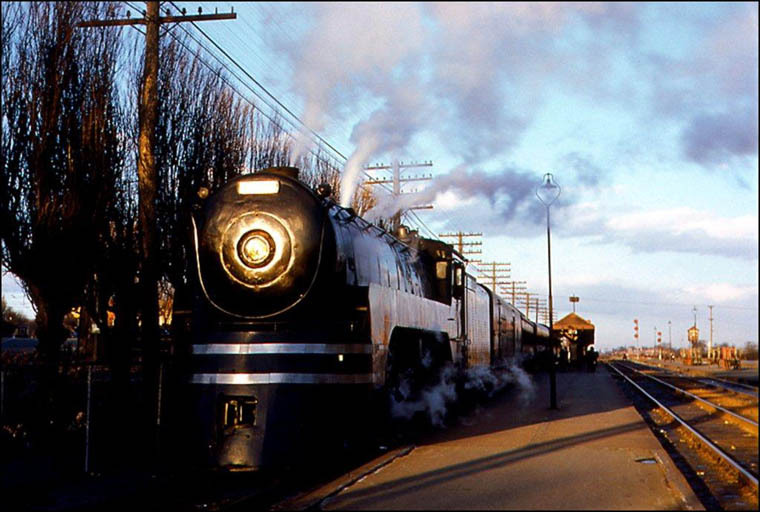 Waiting to return to its passenger train. 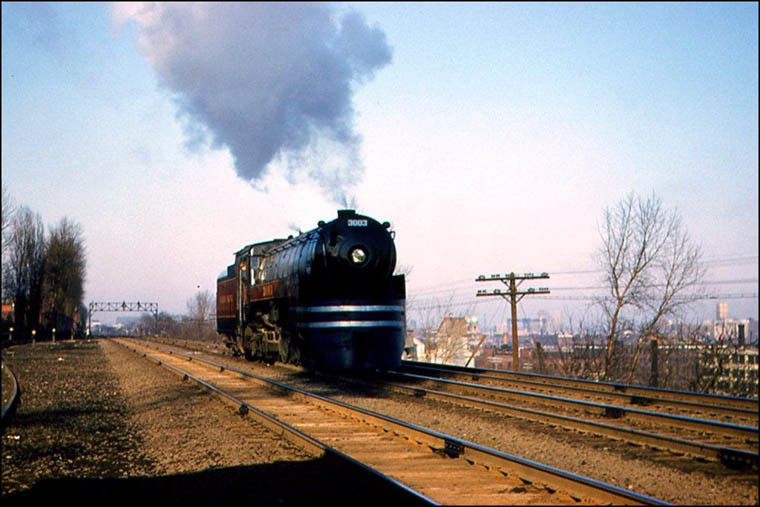 Photo May 23,1953, by Jim Biss. 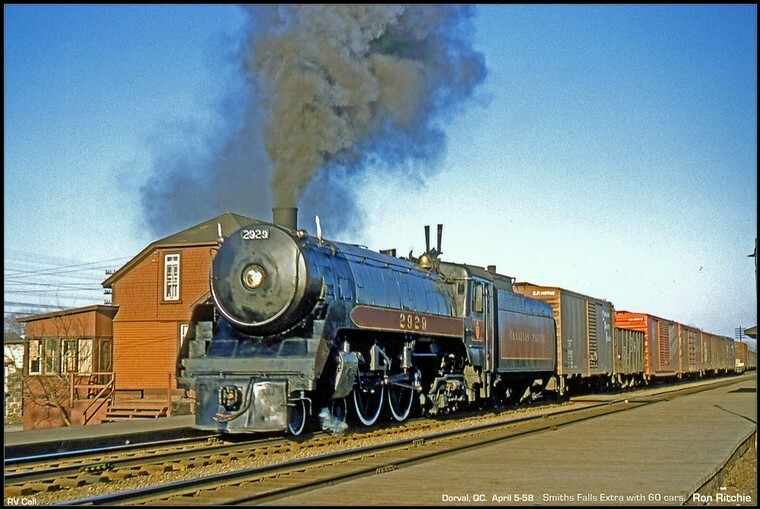 4:20 pm May 23, 1953, headed westerly for Macklin, Sask. Photo by Jim Biss. Looking pretty sharp! Assigned to Moose Jaw in 1958. 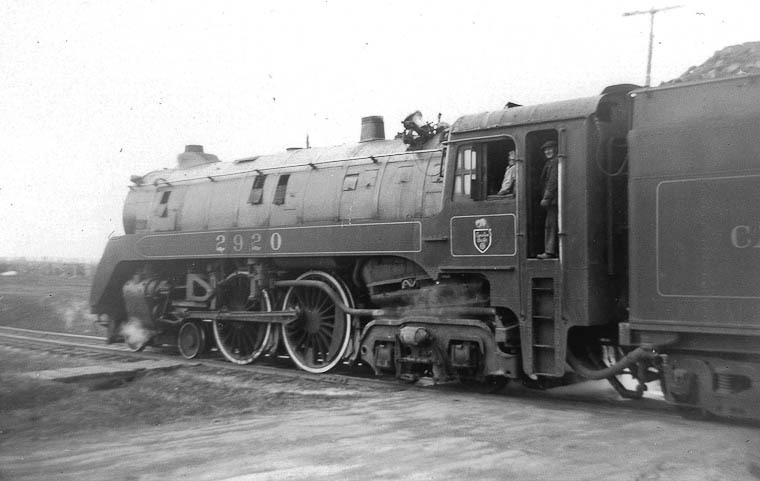 2924 getting underway with a lengthy train. The Park Avenue Sub. was double track but the bridge was a single track bridge spanning the so-called "Back River"
(Riviere des Prairies) between the Island of Montreal at Bordeaux and the Island of Laval at Laval-Des-Rapides. 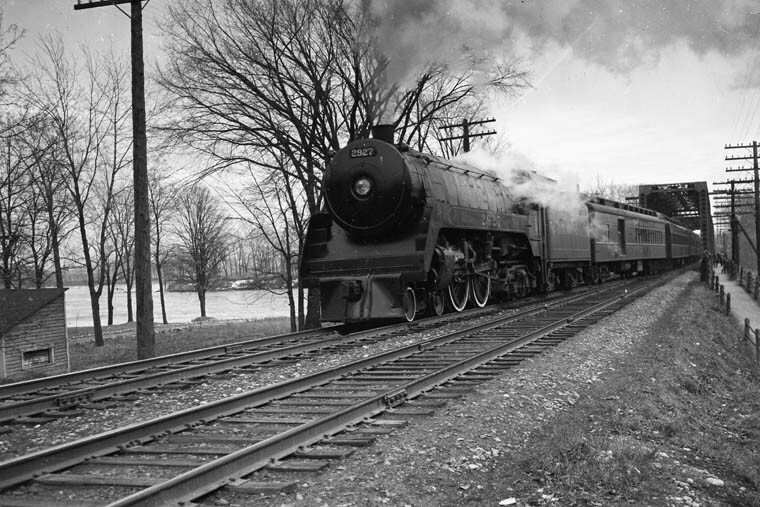 Two views of 2927 coming off gauntlet track with Train # 427 "The Bytown Breeze" Saturday only via Lachute at Westmount on April 7, 1951. 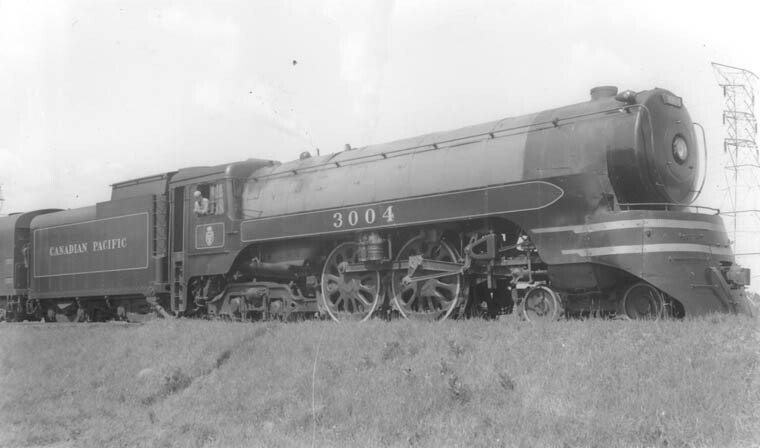 This was an Ottawa-based engine at the time and had double-headed Train # 504 from Ottawa to Montreal the evening before. 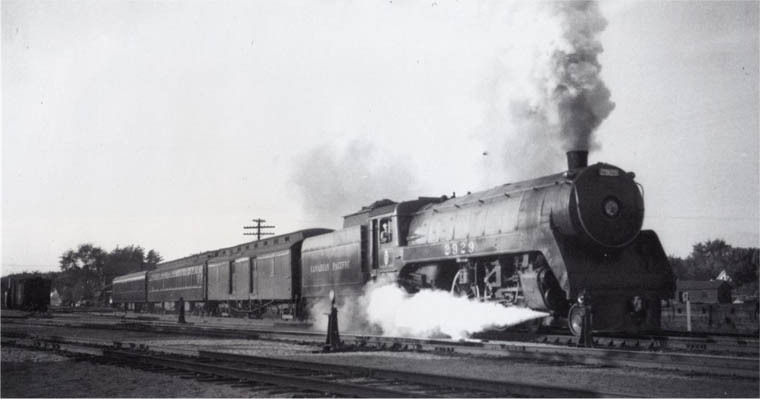 It was traditional to work the second engine back to Ottawa on # 427 the next day as seen here. 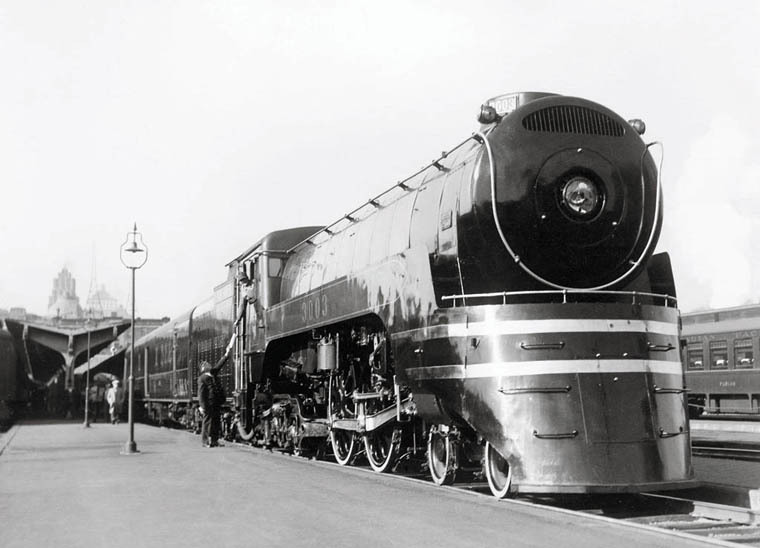 This Jubilee was used on about as diverse a variety of passenger trains imaginable. 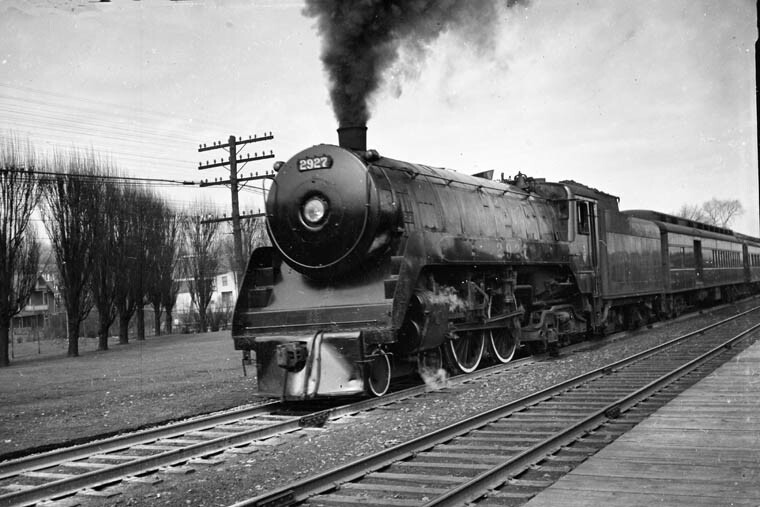 It regularly handled the Ottawa-Maniwaki branch passenger with three wooden cars. It frequently doubleheaded (see below) No. 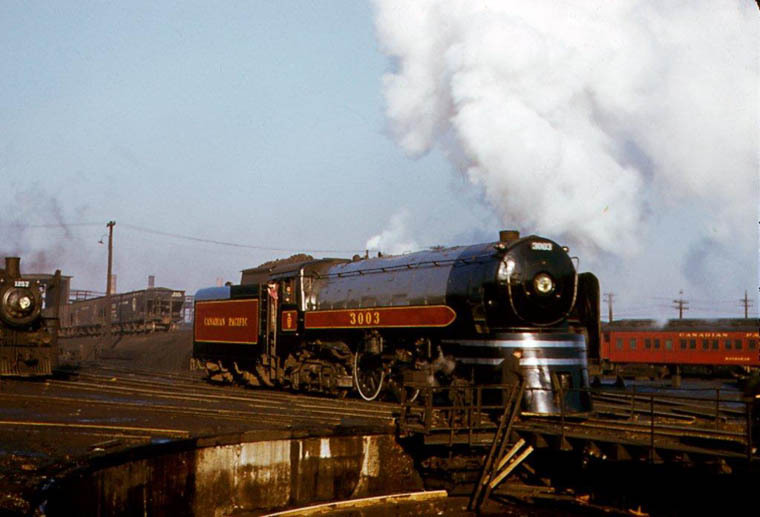 559 the Ottawa-Brockville Pool train on Fridays and Sundays. 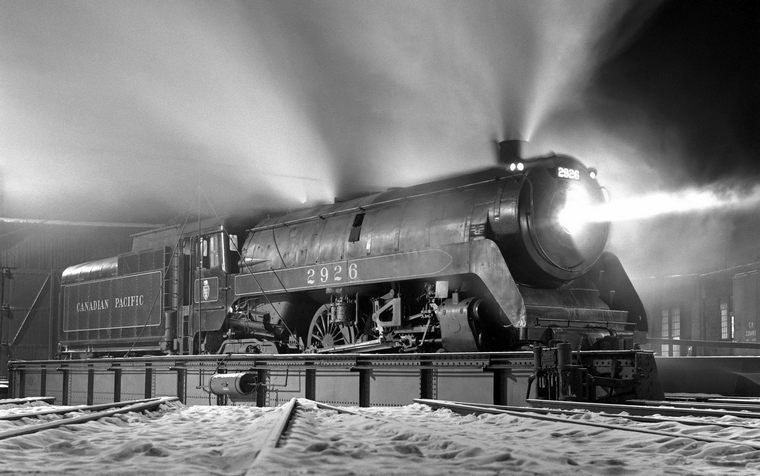 The most unique train it handled in the 1940's and 50's was the "Parliamentary Special" a late Friday night four-car train from Ottawa to Montreal with a through sleeper for Quebec City. Only Parliamentarians could ride this train and they all had passes! Don't let anyone tell you a Jubilee couldn't pull much! More common on the prairies freight here we see Extra 2929 West bound for Smiths Falls with 60 cars! Might have been slippery getting underway but she made it. 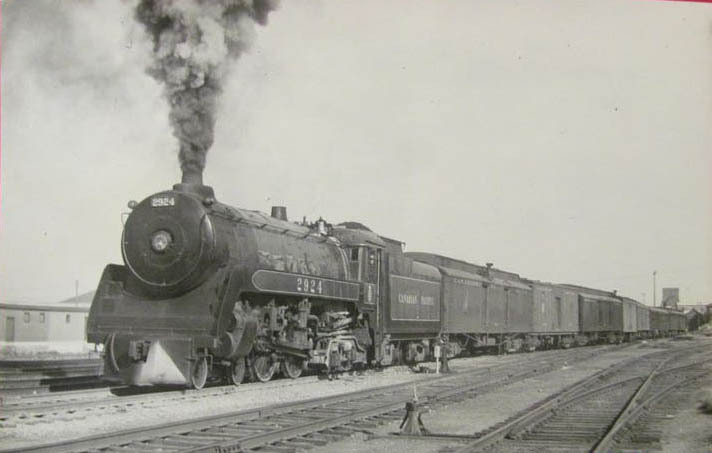 This locomotive was one on the many collected by F.Nelson Blount for his Steamtown USA in Vermont. It never operated. Now at Steamtown National Historic Site in Scranton, PA in a sad state of neglect.